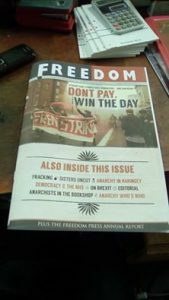 The 2016 Freedom Press report looking at what we’ve been up to and detailing our fundraising drive to stop the place falling down. Plus our editorial on Corbyn and anarchism, comment on Brexit from Matt Black and more! The Anarchist Bookfair and Big Freedom RebuildThe Big Freedom Rebuild: Fundraising Merch!